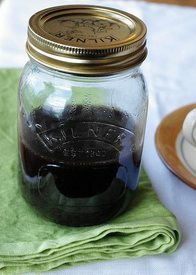 Homemade chocolate chip coffee syrup! Today is National Chocolate Chip Day. I don’t know how these ideas get into my head. I’m munching away on these chocolate chip cookies and I think – wow, I wish my coffee could taste like cookies too. Not just mushy cookies that sunk to the bottom of your cup from dunking cookies in it. A Google search told me that a homemade version did not exist. I started with a simple sugar syrup and added what gives a chocolate chip cookie it’s essence. Viola! A few teaspoons to your morning cup of tea or coffee and you have a lovely aroma of cookies in your cup!